We’ve made idlis and dosas with little millet, kodo millet, proso millet, pearl millet, foxtail millet, finger millet and even made them with teff, which it turns out, is also a kind of millet. Oh, and of course we have made them with paddy rice. (Our millet-farming friends insist on calling what generally goes by the name of rice, “paddy rice” to distinguish it from some of the millets which in the local language are actually called varieties of rice, e.g. సామ బీయ్యము or वरी चावल (little millet rice), కొర్ర బీయ్యము (foxtail millet rice), सामक चावल (barnyard millet rice). In this case the term “rice” is used not as a name for the grain but for the whole form of the grain, as opposed to cracked grain (ravva), flattened grain (poha) or flour (atta). I decided to make idlis using all 11 of these ingredients – 10 grains plus 1 legume. 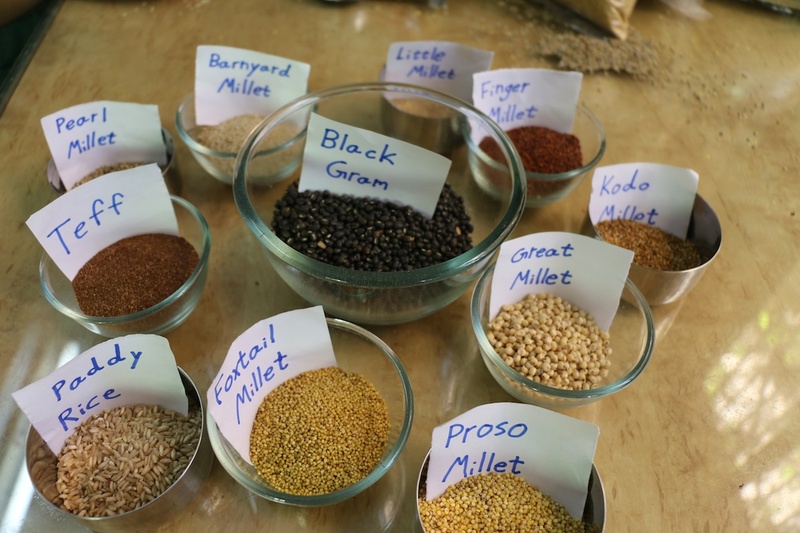 Khiyali measured out 1/4 cup of each of the 10 grains and then 1 1/4 cup of urad (black gram). We soaked and ground them as usual and voila! Note: For step-by-step instructions in making idlis, see this post (with video) on Kodo Millet Idli & Dosa. In lieu of kodo millet you may use another millet or a combination of millets or rice. To make dosas, just dilute the idli batter with a bit of water. See, for example, teff dosa. Of course, first she had a lot of fun observing how the different grains soaked – how long they floated before they sank, and how many she could correctly identify when we removed the labels. And here are the idlis! They were so delicious, the first batch was devoured before I could take a picture. So today I took the pictures first!